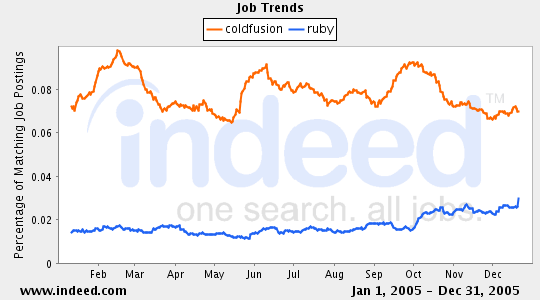 As you can see the word ColdFusion shows up in about 0.06 to 0.08% off all job postings. Ruby is currently at about 0.03%, but growing. y'know, a few years ago (before ASP was called "classic"), Tcl ("Tickle") was touted as the next big thing as far as web programming languages go (much like Ruby is today, IMHO) and where is Tcl now? Ha, I was going to do a posting very similar to this-- one of the founders of Indeed e-mailed me a week or two ago when this feature launched. 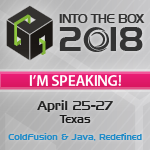 You need to do a -tuesday for Ruby.. there are tons of jobs listed for Ruby Tuesday, and also add a "Cold Fusion" since there are a lot of people that spell it with a space in it. Good points brandon, thanks! Feel free to post any additional commentary on your blog. OO, component-based cfmx lends itself very well to developing an MVC2 framework (like rails, struts, etc.) We have our own cfmx MVC2 framework, complete with data abstraction layer, called "Aqueduct." Still deciding whether to use it internally or to Open Source it.